This is an edited repost originally published by the Australian Jewish Democratic Society (AJDS) on 16 March 2018 on their blog and in Just Voices (issue 15, 2018). It is based on presentation given by Clare Land at an event in Melbourne on 4 September 2016, Decolonisation Forum: From Australia to Israel-Palestine, organised by AJDS, where she spoke alongside Prof Gary Foley (Victoria University), Dr Sary Zananiri (Monash University) and Niva Grunzweig (zochrot.org). 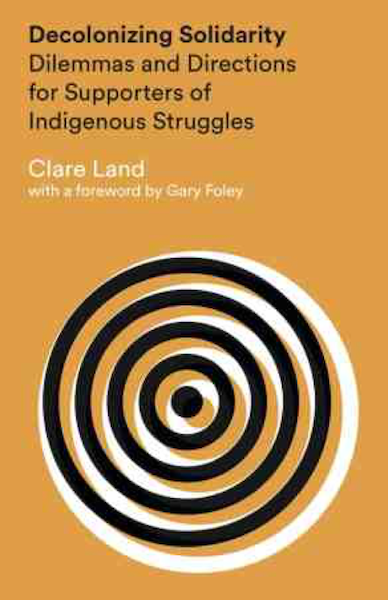 Dr Clare Land @Clare_Land ‏is a non-Aboriginal activist and researcher who has been involved in supporting Aboriginal land rights struggles in southeast Australia since 1998. Her book Decolonizing Solidarity: Dilemmas and directions for supporters of Indigenous struggles is a comprehensive resource about the ways non-Indigenous people can work in solidarity with Aboriginal aspirations today. The term ‘decolonizing’ is something of a buzz word at the moment. I want to offer three ideas to those looking for starting points to think about ‘decolonizing’, decolonization and their location regarding it. First, since my book is called Decolonizing Solidarity: Dilemmas and Directions for Supporters of Indigenous Struggles, a couple of thoughts about what I mean by ‘decolonizing solidarity’. Then a comment on ‘decolonizing the mind’. Then a comment on the political underpinnings of decolonization in Australia in comparison to the buzz word of the 1990s: reconciliation. At the outset I want to share what I mean when I talk about decolonizing solidarity – the title of my book. The title pays homage to an earlier book first published in 1999 by Maori scholar Linda Tuhiwai Smith, called Decolonizing Methodologies: Research and Indigenous Peoples. No doubt her title pays homage to an earlier book by Kenyan scholar Ngugi Wa Thiongo: Decolonizing the Mind: the Politics of Language in African Literature (1986). Now, in contrast to the authors of those two books I write as a non-Indigenous person. And I only know the limited amount I know about racism and Indigenous struggles from Black scholars and people of colour, and Aboriginal scholars like Gary Foley. So it is appropriate for me to make this very clear in terms of the genealogy of the ideas I peddle by clearly giving credit and paying homage. Firstly, the argument of the book is that the way non-Indigenous people in Australia express support for Aboriginal struggles is often problematic and needs to be decolonized. Without realising it, people of colonial backgrounds who aspire to be supporters of Aboriginal struggles often bring a deep paternalism with them. This needs to be recognised and undone. It undermines and takes energy away from the political agendas of Aboriginal people and dealing with racism also creates a great emotional burden. Beyond that, for Aboriginal people to be educating supporters who are struggling to come to terms with how they/we might be shaped by the colonizing world that we are a part of and who might be defensive about that is an additional massive burden. All this is one reason why it is often a lot more powerful for Aboriginal people to do their own thing in struggle than to work in ‘black and white together’ organisations. So those who are non-Aboriginal have to find ways to both be guided by and also not be demanding of Aboriginal people. Secondly, decolonizing solidarity means that solidarity should be decolonizing. Solidarity should be a force for decolonization. Not for reconciliation or other such immaterial movements. In a nutshell, that is what Aboriginal people from the political community relation in to whom decolonizing solidarity is written are saying. So, the solidarity of the kind that I write about is about supporting the political agenda of Aboriginal people whose movement is about Land Rights, Self Determination and Economic Independence. The Black GST also came out of this same political community. The Black GST is about Genocide, Sovereignty and Treaty. Decolonization is about the return of land and power. It is about supporting Aboriginal peoples’ struggle for survival as distinct peoples and returning stolen wealth. That is what colonization has been about here in Australia, a settler colony. It has been about eliminating Aboriginal people and settling in their place. If you look at what my forebears did you can see the major techniques of settler colonization. Taking land and children, snuffing out language, taking over in terms of what laws are in place and in force. Colonization has also tried to lump Aboriginal people into one mass – erasing all the diversity within this continent. Colonization has also appropriated the right to certify who is Aboriginal and who is not. And who is going to be recognised as the owners of a particular place and who is not. All of these things have been resisted but most of these things are the subject of ongoing struggle. So to get an insight into the decolonization agenda in the current day, you can work out what the opposite of these major techniques of colonization are, and what the current political realities are and there you have it. One of the most pragmatic solutions to the current political reality is the notion of Pay the Rent. That is the idea of people of colonial backgrounds paying rent to Aboriginal people for the occupation of this land. As Gary Murray said in an interview for Decolonizing Solidarity: ‘You take Aboriginal people’s land away forever, you pay rent forever’. Now, about ‘decolonizing the mind’. Interested people will have heard of this phrase and may well be able to imagine into what it probably means. It is about native people’s psychological recovery, unlearning ideas of inferiority and self-hate imposed by colonial processes, and reclaiming cultural pride. Decolonizing the mind is the title of an important book by Kenyan scholar Ngugi Wa Thiongo which was published in 1986. Its main concern is the politics of language in African literature, and the importance of farewelling English and French to write in African languages (such as his own – Gikuyu). It addresses the colonial legacy that has remained so strong even after formal decolonization in countries across Africa occurred. So, it is extremely important to think about material and political decolonization, and not to somehow skip over those things straight to decolonizing the mind. People of colonial backgrounds are also profoundly shaped by the colonial process and there is a huge amount of work to be done for people like myself to unlearn ideas about Australia and about Aboriginal people that are constantly repeated by dominant cultural sources like media and schools and universities. However, decolonization is not mainly about attitudinal change, or critique. And it is not a process that is independent from the return of land and power. Now I want to return to ideas about solidarity, and reflect on how the politics of being in solidarity differs from place to place. Looking at aspects of solidarity politics in other struggles and places helps to bring into view some big questions about the assumptions of would-be supporters of Aboriginal struggles in Australia. Let’s take a look at ‘non-normalization’– one particular aspect of solidarity politics in Israel and Palestine– because I think when you do that, you can really reflect back on some things here with a greater sense of cynicism, if you are not wholly cynical already. To paraphrase some ideas that are in my book: non-normalization is a position that criticises and boycotts any collaboration between Palestinians and Israelis that creates the impression that harmony exists or that it can be created without attention to the return of land and refugees. It says that giving the impression of harmony and normal life is deceptive and may mislead outside observers about the real situation. The non-normalisation stance calls for a boycott on activities that bring the two sides together for any reason other than to further the goal of strengthening resistance to the Israeli occupation and all forms of discrimination. That is, until Israel complies with international law and Palestinian rights. So by way of conclusion, I’ll offer some thoughts about what you can do if you want to express political support of Aboriginal struggles. Gary Foley has suggested that supporters form into like-minded little groups and affiliate themselves to Aboriginal groups. The task is to learn as you go, and stay up to date about what needs to be done in support and do it with a minimum of fuss. There are some great little crews around who are really in a good position to be of practical support to rallies and actions: the Street Medics and the Legal Observers group. If they are not happening at the moment then they might need new energy. Or you can just take inspiration and think about what you could do – a screen-printing group, a photocopying group, a postering group, a self-education study group that also creates events and forums – spaces to educate self and others. If you are organised into a group then you can be called upon to be a support to Aboriginal-led campaigner groups. The important thing here is a group to group relationship. There is something very powerful and good about that because each collective does a lot of its own work to empower and challenge its members. Support groups should work towards reaching a shared understanding of motivations and practice, and should also be committed to challenging and holding each other accountable when colonially-shaped ideas reveal themselves (as is inevitable). There is a collective spirit in all of it, which is good. But there are some things you can do when there is no obvious political Aboriginal group doing public stuff. That is not the case at the moment but at times it might be. There is no harm in continuing to educate yourself about Aboriginal struggles of the past and present – that can be done at any time and without asking much of Aboriginal people. It can be done by seeking out any opportunity to hear or see or read things authored by Aboriginal people. There is also lots of work to be done in getting to know how racism and paternalism works, and in examining how every one of us is shaped by all our transactions with the white-dominated world. Anyone of any background is shaped by this – obviously how this impacts on you depends on who you are and the ways in which both oppression and privilege may shape your life. Some people will know well the experience of moving in and out of worlds within the same city.